Our dedication to all of our animals has spurred us to start the Second Chance Fund. This fund allows people to donate directly to the care of our sick and special needs animals, which helps to alleviate some of the financial cost that comes with their extra care needed. All monies donated to the Second Chance Fund will directly offset the medical cost for those pets with needs beyond routine medical care. 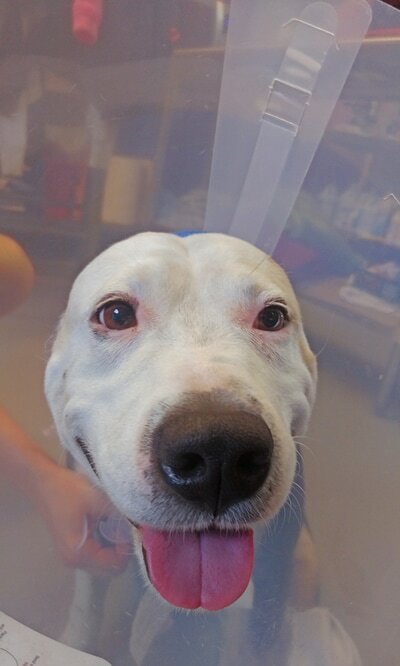 ​Be a part of the healing process for a shelter animal in need and donate to the Second Chance Fund today! ​Hali the kitty is a special case at GCHS...and she is a sweety! 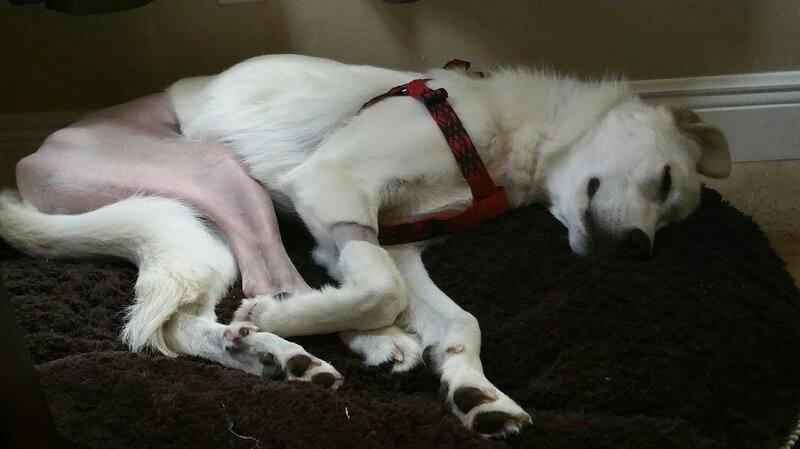 Hali's hind leg had to be amputated due to an injury she suffered previously she came to GCHS. The Second Chance Fund was used to pay for her surgery and now her rehab. 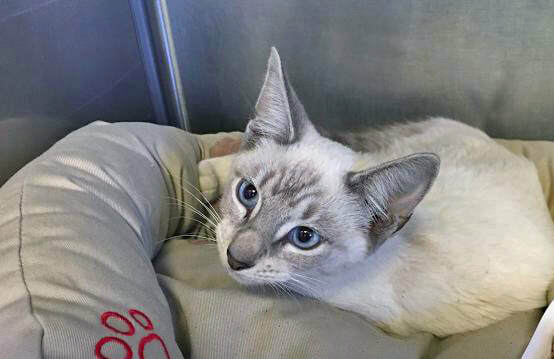 Hali is up for adoption and we are hoping to find her forever home quickly, so she can start her recovery physically and emotionally, as soon as possible. She is a gem! The Second Chance Fund is an important fund at GCHS, used to help pay for necessary health care for animals in need. Here is Hali's story: "Hello, my name is Hali. I had a rough start in life and as a result I am a bit timid of people. "I was injured and my left rear leg was amputated. Please don't feel sorry for me, though. I can run fast, go up and down stairs and can climb up on a bed where I like to sleep. "When the foster lady picks me up, I love to have my head and back rubbed and I'll purr. Even though I am timid and might run from you, I have never bitten or scratched anyone. "My foster cat brother wasn't thrilled at my arrival but I am getting along really well with him, although like a typical brother he likes to chase me! I am a really sweet little girl but just need a little patience and time to get to know you." Fund, which pays for the procedures and rehabilitation the animals have to go through. to GCHS that same day to start his rehab. a laterally luxated patellar, which was dislocated on the outside of his leg. 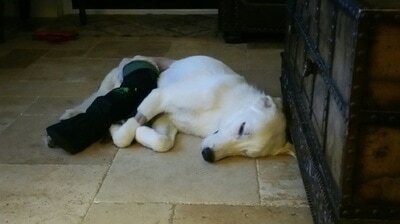 been in foster care during his rehab, in which he is getting used to walking on his fixed leg. The cost of Harvey’s surgery ranged in the $1,600 area, while Bear’s cost $1,400. Director, Jennifer Galloway. “It’s a vital fund for these animals who really have nowhere else to turn. After each of Harvey's and Bear's rehab, both were eventually adopted, all thanks to the Second Chance Fund. Independence came to GCHS from Collier County. He arrived with multiple injuries, the most severe being his missing nose and upper lip. It is believed that Indie was used as a bait dog for dog fighting. He also had scarring on his leg from where he had been chained. 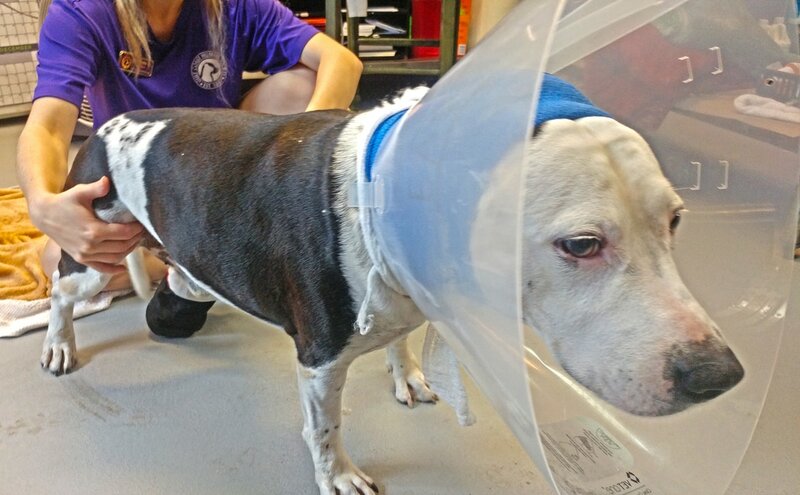 With the help, compassion, and care of Animal Specialty Hospital of Florida (ASH) in Naples and the veterinary staff at GCHS, Indie has been recovering. Although he is still healing, he is slowly gaining weight and his personality is starting to shine. He loves to be around people, other dogs and is happy to have the love and attention he has missed. The support, love, and encouragement Indie has received from the public has been amazing. We cannot thank you all enough. If you have any information about dog fighting, please call Crime Stoppers at 800-780-TIPS. You can remain anonymous and receive up to a $6,000 reward if your tip leads to an arrest. Mojo was a one year old Catahoula Leopard Dog mix who was transferred to the GCHS from Lee County Domestic Animal Services. When Mojo arrived he had what was thought to be a spider bite on his left leg. However, the so called "spider bite," would not respond to antibiotics and Mojo's condition worsened. To help determine what was really wrong with him, a skin biopsy punch was used to acquire four samples of the dermal mass from four different areas by Dr. Eisele at Specialized Veterinary Services. The results showed that Mojo had Pythiosis which is caused by a fungal-like aquatic organism that exists in stagnant water or on grasses that have been exposed to stagnant water. The disease is most common in tropical or sub-tropical climates. In the USA it tends to be seasonal, most commonly between August and December, and can affect dogs, cats, and horses. In dogs, Pythiosis can occur on the skin, gastrointestinal, or as multi-systemic forms. Mojo was afflicted with the skin form of Pythiosis which occurs when the organism comes in contact with an open wound. Signs of the disease include wounds that won't heal properly, ulcerated small lumps, and fistulas. Hairless lesions are most commonly found on the tail, legs, stomach, neck, and face. They are extremely itchy and irritating to the dog. Surgery to remove the affected tissue, leaving wide margins, can be effective for the skin and gastrointestinal forms but will not cure the dog if it does not completely eliminate all of the lesions. As in Mojo's case, limb amputation was necessary. After amputation anti-fungal medication is given for 2-4 months. 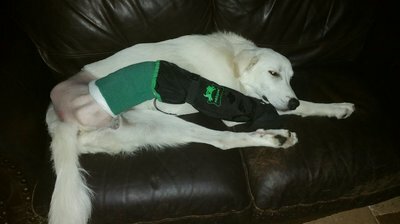 To give Mojo the best chance of survival and quality of life, it was decided that his left hind leg needed to be amputated. Even with a discount, the cost for the surgery amounted to $1,330.00 which did not include previous or continuing medication. Mojo's situation, and our dedication to all of our animals, has spurred us to start the Second Chance Fund. This fund will allow people to donate directly to the care of our sick and special needs animals, which helps to alleviate some of the financial cost that comes with their needed care. We've added a separate way to donate on the website and you can make checks payable to GCHS Second Chance Fund. All monies donated to the Second Chance Fund will directly offset the medical cost for those pets with needs beyond routine medical care. Mojo found his Forever Home about 1 week after returning to the GCHS from recovering in his Foster Home. Meet Sunset who, on January 27th 2015, became a Gulf Coast Humane Society Second Chance Fund recipient. Sunset was found in Lehigh Acres, Florida in rough shape. She is known as a bait dog, which is a dog used to train other dogs to fight. Sunset has come a long way on her path to recovery. The GCHS Staff has been blown away by the amount of support and encouragement we’ve received over Facebook and Instagram for Sunset. Sunset was adopted March 5th to a wonderful family. If it wasn't for the Second Chance Fund, Sunset wouldn't have been given a much deserved Second Chance. Handsome Hank came to GCHS from Hendry County. He was neglected most of his life and likely kept in too small of cage. His back was deformed and he was severely underweight. Hank was full of fleas & ticks, had mange and was hardly able to walk. He is now recovering from his years of neglect and abuse. He is slowly gaining weight and muscle in his legs. His foster family reports Hank is even starting to play with toys! Jimmy, a 1 year old Terrier Mix, was found in Clewiston, Florida, under a porch, with an open wound exposing bone the length of his back right leg. Because of the severity of his injury, Clewiston Animal Control transferred him to the GCHS. Jimmy arrived at the GCHS on July 27th and was immediately transported to Specialized Veterinary Services for treatment. It is estimated that Jimmy had been keeping the wound clean himself for approximately two weeks. His injuries were so extensive that the best course of action for Dr. Cavanaugh, DVM was to amputate Jimmy's leg. Along with being severely emaciated, Jimmy also has scar patterns on his head, legs and body that are consistent with being used as a "bait dog." He is acclimating well since his amputation and is currently recovering from surgery at the GCHS. Ellie, an approximately 2 year old Hound Mix was found in Clewiston, Florida with an injury to her back right paw. While the Gulf Coast Humane Society and Clewiston Animal Control are unsure what caused the injury, it was substantial enough to have cut through bone, leaving an open wound with bone exposed. Ellie was transferred to the GCHS and went immediately into surgery where her toe was amputated. 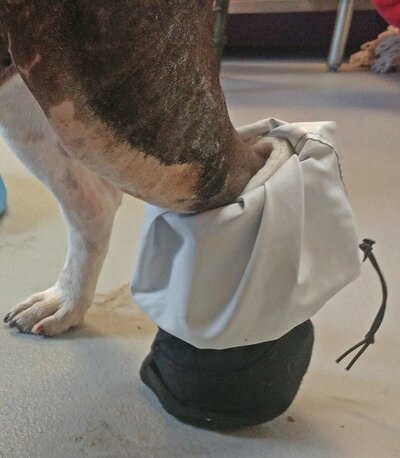 Despite the pain she must have been in, Ellie's tail never stopped wagging. She's a sweet girl who enjoys attention, sitting in your lap and holding your hand. Her continued care and medication was required from the Second Chance Fund. Thank you to Specialized Veterinary Services and Animal Medical Center of Lehigh Acres for taking such excellent care of our Second Chance Fund pets.